Wedding Show Update & Two Lucky Winners! Big Day! Wedding Show, Contest & New Product! It was a busy weekend. The Chatham-Kent Wedding Show was at The Bradley Convention Centre on Saturday and we had a booth. I have never seen the show that busy....so nice to see! We received great feedback from girls saying they enjoyed my designs, as well as the feel of our booth. The Paper Pickle was there the only way we could....with burlap, our barrel table, antiques and even our bike! Our new banner let everyone know that we are the area's exclusive Envelopments dealer! Simple yet elegant invitations designed by The Paper Pickle. A side view of the booth. Lots to see! Even our bike made it to the show. I wanted to show people that it is possible to have fun with your stationery. Add a little glitter, wax seals, banners and more. We design place cards and stationery for any event. Check out the new kissing balls from Weddingstar. They are made of wood. I would love to try making these out of paper. I have so much fun setting up my booths at shows. More great samples to see! Bird theme weddings are very popular. Here is a menu and place cards from a wedding last year. The little salt and pepper shaker favours from Weddingstar are adorable. Order through The Pickle and save the tax on all Weddingstar orders. Another kissing ball and stationery designs. Burlap has always been a favourite at The Pickle. We had a little draw in The Paper Pickle booth. I promised to announce the lucky winner today! Drum roll please.....the lucky winner is Brent Ferguson! Looking forward to designing beautiful stationery for your big day! We also had another contest going on at the store. I asked many of you what new CHA releases you absolutely love. Thank you to all that took the time to research AND enter the contest. I am looking forward to bringing in many of your recommendations. I asked my assistant, Julia to draw the name for me. The lucky winner is NICOLE! Nicole, I would really like to give you your winnings in person. I hope you can come in to the store on Saturday! Just email me! I am looking forward to sharing with you some great ideas I have for the store in the next week. A couple of things still have to be finalized before I can officially announce, but one hint is that there is a little tape on the floor marking the change! I have a feeling tomorrow is going to be one busy day! The Chatham-Kent Wedding Show is happening at the Bradley Convention Centre from 11am-6pm and The Paper Pickle will be there displaying our beautiful and crafty designs! Our booth always stands out as we are the burlap booth among all the satin! And you know what? I wouldn't have it any other way! Have a look at my banner and gorgeous door which I will use in my booth! I have bigger plans for that door too....stay tuned! You may see it at the new store! If you haven't been in the store in the past couple weeks, you may want to stop in! 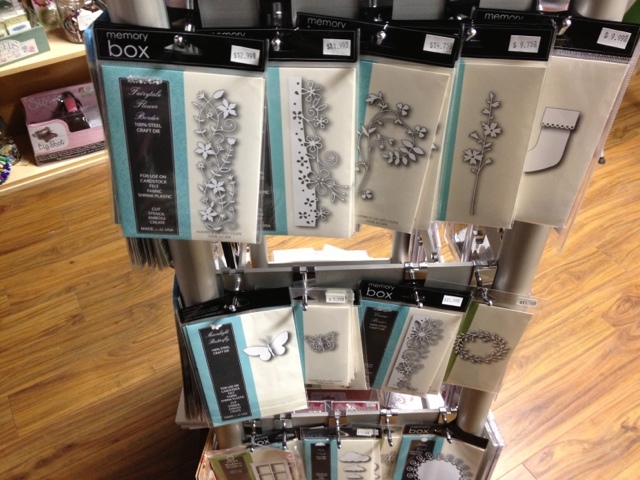 We have some beautiful new Memory Box dies now in store! Check out how full the rack is! We do have another huge shipment arriving late next week. These are some of the backorder dies including the gorgeous baby carriage, bike, hearts and more! Did you read my last blog post? Well you better get reading and posting suggestions! You only have until the end of day of Sunday January 27th to qualify! Your chances of winning the BIG prize (over $100 of beautiful product from The Pickle) is VERY good! For those of you who have already taken the time to make suggestions....thank you! You are helping to make my job easier and helping to make the store a better place! Thank you! Have a wonderful weekend! Crate Paper - Fourteen now at The Paper Pickle! CHA Winter - Oh My Gosh! OK. I admit it. I will admit to you, my crazy paper loving friends, that I just spent an obscene amount of time on YouTube checking out videos from CHA. New product. From every company imaginable. It was sick! I mean, SICK....the amount of time I spent searching and drooling.....wanting to see it ALL. What I don't understand is how these companies manage to keep getting better and better with every release? Do you feel this way too? And another thing that amazed me is that today, you can see it all from the comfort of your own home. It was like being there....well almost. Remember the year Kell and I stalked Paris Hilton while attending CHA! Here is the post from 2009 with the video proof that we did in fact stalk her, not on the web, but in person! There is nothing like attending those shows but I have to admit that tonight WAS fun! Why don't you gush along with me? Why not post about your latest loves? Need a little incentive to gush openly, in public, on this blog? I'm here to help! So here's the deal. Anyone that comments on this post, and tells me about their favourite release at CHA or about products I should carry at The Pickle, will be entered into a draw. You will receive one ballot per post per day. All comments and suggestions must be posted by the end of day Sunday January 27th. Then on Tuesday, January 29th, I will blog and reveal the BIG winner! So what can you win? Now don't you worry your pretty little head about this! Let's just say that I will take good care of you! I will promise at least $100 of my favourite things from The Paper Pickle. Sound good? Come on....don't be shy! Please share with me and everyone else so The Paper Pickle can be THE coolest paper boutique EVER! Open tomorrow! Stop in and say hi! Or by appointment if discussing invitations! Happy 2013! I know. I know. Already half of the first month of 2013 has passed and there has been no sign of me! Trust me.....I have very good reasons why I have been absent on the blog scene. I have been Christmas-ing, crafting, doing "While You Were Outs" and then vacationing in Jamaica! Looking back, I am still not sure how I got it all done. Today was my first day back to my "normal" life and I have to admit that things felt a little awkward at the start of the day. Naturally, like riding a bike, it all came back to me. Sigh. 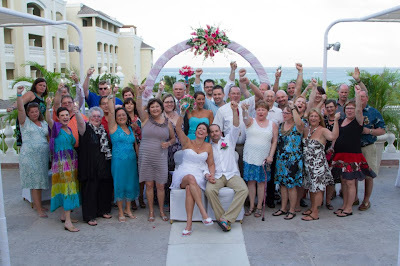 The reason for Jamaica was for our friend's wedding and I would love to share a few photos. I have been dying to share this invitation with everyone! Have a look that the 4"x9" pocket style invitation (pockets and paper by Envelopments). I absolutely love how the invite turned out. The cutest part, besides the adorable enclosure "tags" was a little wooden heart that sealed the pocket together. I used the wooden veneers from Studio Calico. I adore adding crafty little details to my invitations! I think the little details are what makes a project come to life! Check out the fun black twine on the tags! 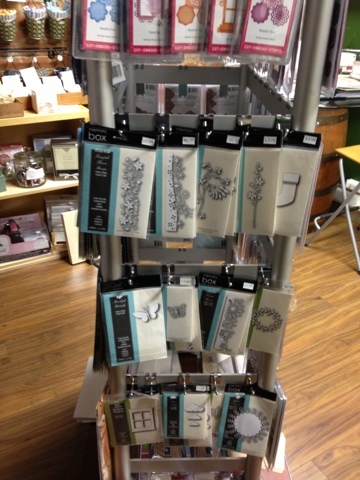 Did you know The Paper Pickle is Chatham-Kent's exclusive Envelopments dealer? Tip #341 - Never use glue dots to attach the circles to the enclosure tags and THEN punch the hole using a crop-a-dile! I thought I was so smart using glue dots rather than messy glue. I ended up jamming my crop-a-dile so bad! Lesson learned! Do not try this at home!! Ha. Thank you for humouring me as I share....I have been known to share a little too much at times (actually you will NOT be seeing those pics! Ha!). The only thing I will say is that I DID dance on the beach on a couple of occasions and I DID run on a slip and slide in the pool olympics! This was our first time doing an all inclusive and it will certainly not be our last! Here is the view from our room. And yes, that really was coffee in my hubby's mug! Andy and Carrie had quite the entourage. 34 in all! Now THAT'S a lot of fun and laughs! What a crew! I am at the very back just to the left of the arbor. So it is back to the grind after a very nice time off. I am energized and ready to have the most amazing year! 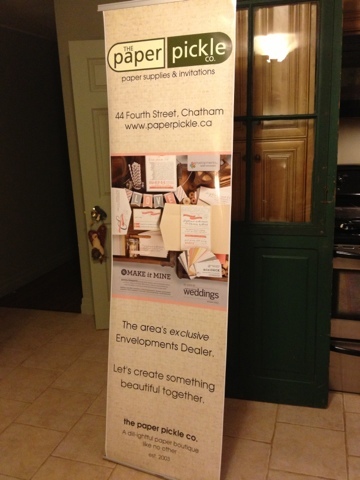 I am gearing up for the Chatham-Kent Wedding Show on Saturday, January 26th from 11-6pm at the Bradley Convention Centre. Come and see me if you are interested in talking stationery! I would love to help you design your invitations or those of a friend! If you haven't noticed, I have a thing for paper and would love to assist in anyway I can. On another note....Did you see that CHA is happening right now in California? For those of you who have not been following along with your favourite company's releases via blog, have a look at The Scrap Reviews previews! They provide the most comprehensive listing of new products! And yes, I am in love AGAIN! We will chat more this week about your favourites....I would love to hear about your favs! All I have to say is that I am reconsidering my decision. I think stamps MUST make a comeback at The Pickle after seeing Tim's latest release with Stamper's Anonymous!!! !